With the invention of smartphones, everyone likes to think of themselves as a photographer. While that thought may be okay, professional photography exists in a much higher level, and to get there, a process has to be followed. If you’re looking to become a professional photographer, be prepared to incur expenses and to digest vast amounts of information that could, at times, be overwhelming. On the brighter side, you will be able to experience and display the world from a whole new angle – breathtaking sunsets, peculiar animal behaviors, wildlife, cultures, fashion, and more. But what are the steps to getting there? Keep reading to find out. Do you fancy stunning landscapes or abstract imagery? Or, do you love travelling and taking pictures of cities, roads, and other travel-related photographs? Maybe you like capturing events like weddings, or you find yourself capturing animals in the wild. Perhaps you’re into sports photography or crafting photoshoot. Cling onto whatever it is you that inspires you and venture into that line of photography. There are those of you who love to simply capture every moment that looks interesting without really specializing, and that’s all right. As soon as you have a perfect idea of the kind of photography you want to do, the next step is to get a camera that will help you take great photos. Today, your options are wide-ranging because tell you what? There are phones out there with cameras so mighty that they’re able to rival top-end camera tech. If you can get a phone like the Samsung Galaxy S9+ or the Huawei P20 Pro, you have enough camera tech to kickstart your photography career. If you don’t want to use a phone, there’s a stunning array of camera brands out there to choose from, including Canon, Nikon, and Sony. At this point, you have the right camera and are now ready to start shooting. If you’re to succeed, you need to keep this rule in mind – quality over quantity. Before you click the shutter, take a few moments to review the scene, focus on what you’re shooting and frame the shot carefully. Perhaps tilting the camera to the left or right will add a story and give a more appealing touch to the photo. The viewfinder can help you a lot when it comes to focusing the picture. Many people have cameras or phones with amazing cameras, but they hardly know the features that these cameras carry. To be able to make the most of the camera, you need to know the camera’s features. Spend time understanding the features and the functions, and especially focusing on the exposure triangle, which is made up of the Shutter Speed, the Aperture, and the ISO. By studying and knowing your camera, you won’t need to depend on the automatic adjustment anymore. You’ll be able to adjust it manually and set it just the way like, thus broadening the creative possibilities in your shots. There’s a lot you can learn from a workshop. There, you will gain knowledge on a range of subjects including camera settings, photo editing, framing rules, and even professional lighting. 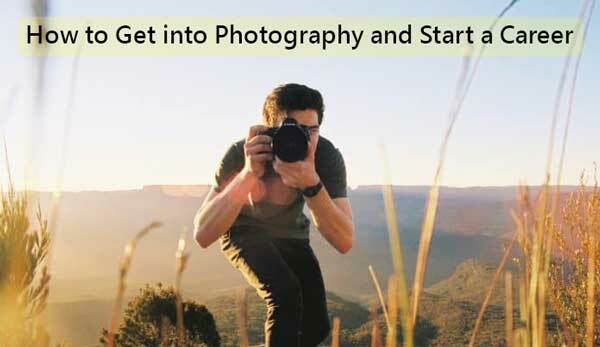 You will learn what makes photos visually appealing and gets lots of other invaluable photography education. Light is a crucial photography aspect that has the power to make or break a photo. As such, it is vital that you learn how to use light to your advantage. It would help if you learned how to position your subjects correctly in relation to the light. Whether you choose indoor lighting or diffused sunlight, you have got to ensure the light is ambient. When starting out, you will probably not have studio lights and professional light modifiers, but you can make do with props like DIY light filters and reflectors to create silhouettes, nice highlights, shadows, and so forth. As they say, experience is the best teacher. You can go to school, read everything about photography and watch countless video tutorials but the only way you will gain practical skills is to get out there with your camera and actually take photos. Combining the knowledge you’ve gained through learning and the experience you will be getting through active photography, you will be able to accomplish your visions as a photographer. You could even organize shooting activities with friends who are into photographer or take part in local competitions. To be honest, reaching the point where you can call yourself a photography expert will not be easy. There’s a lot to learn and battles to fight to get there. At first, it will, in fact, be safer to call yourself an amateur shooter and work towards improving your skills through learning and experience. As with any other career, you pushing hard and being patient are essential ingredients. Remember, it’s quality over quantity. We’re going to take it that you will start with inexpensive camera technology like a phone or a cheap professional camera. But after using this for a while, say two years, you’ll have learned so much and gained lots of experience, and perhaps you will want something that helps you grow. At that juncture, you will need to get a better camera or buy better parts like lenses and external flashes. A tripod and perhaps a battery grip are other great additions that you will want to consider when you want to level up. Going commercial with photography has become both difficult and easy depending on how you look at it. What makes it difficult is that there are many photographers, meaning the competition for clients is high. On the plus side, not many of these photographers are able to provide the professional quality that clients are looking for. Furthermore, with the rise of the social media, displaying your prowess and getting clients has become much easier. So, the first thing to do is create a website to serve as you display shop. Apart from that, use Pinterest and free stock image sites like pixabay.com to show the world what you’re capable of, and you might just attract clients. But when it comes to promoting your work, nothing beats the social media. Therefore, post the most stunning shots with a link to your website. 1. How can I do to transform my photography hobby into a career? First, develop a portfolio showcasing your work and put it on your website. Next, get a mentor who has been in the business of professional photography for a long time to show you the ropes. By focusing on building technical skills, you will set yourself up for success. If you’re looking to get employed as a photographer, it would help to purse a photography course in college. 2. How much can I get paid as a photographer? Companies pay their professional photographers an average of $35800 annually. In the district of Columbia, photographers get compensated more handsomely, taking home about $55000 annually. 3. What sort of jobs can I get with a degree in photography? 4. How much do beginner photographers charge? According to Petapixel, beginners charge 25 to 75 dollars per hour. Professionals, on the other hand, seasoned professionals make 75 to 250 dollars per hour or image. 5. What is the best college for pursuing photography? If you’re doing photography as a hobby, and would like to turn it into a career, then all you need a little more dedication. If you already have a collection of great pictures, place them on your website and your social media page to show the potential clients what you can do. And if you don’t have a very good camera, it’s time for an upgrade. Learn as much as you can from the seasoned photographers but remember, as they say, practice makes perfect. So, get out there and start taking some exquisite photos.